With an increase in public interest in physical fitness, clinical practitioners are diagnosing stress fractures with greater frequency.First described by Aristotle in 200 BC, stress fractures were initially recorded in the medical literature in 1855 by the Prussian military physician Breithaupt, who described what is now known as a march fracture, or stress fracture of the metatarsals. See the images below. Radiograph of the feet. This image depicts a stress fracture of the left second metatarsal with exuberant callus. 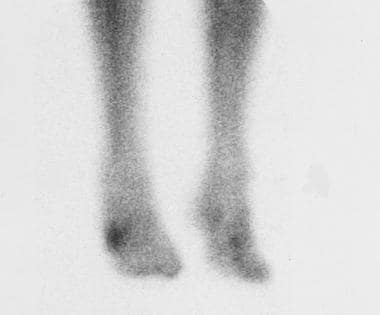 Radiograph of the left foot. 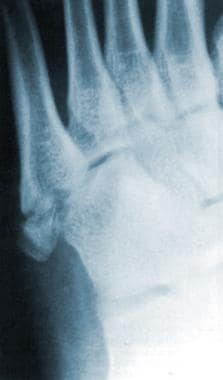 This image depicts a stress fracture of the fifth metatarsal. Bone scan of the lower extremities. This image depicts a right fifth metatarsal stress fracture. 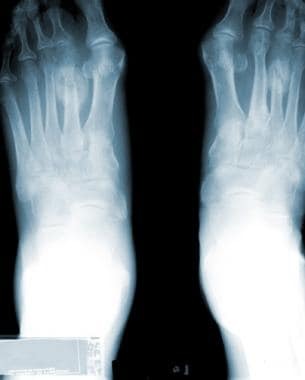 Metatarsal stress fractures are not limited to high-level athletes or military recruits. This type of injury is seen in runners of all levels, as well as ballet dancers and gymnasts and patients with rheumatoid arthritis (RA), metabolic bone disease, and neuropathic conditions. Metatarsal stress fractures are also seen with increasing frequency in patients who engage in aerobics activities, particularly high-impact aerobics.